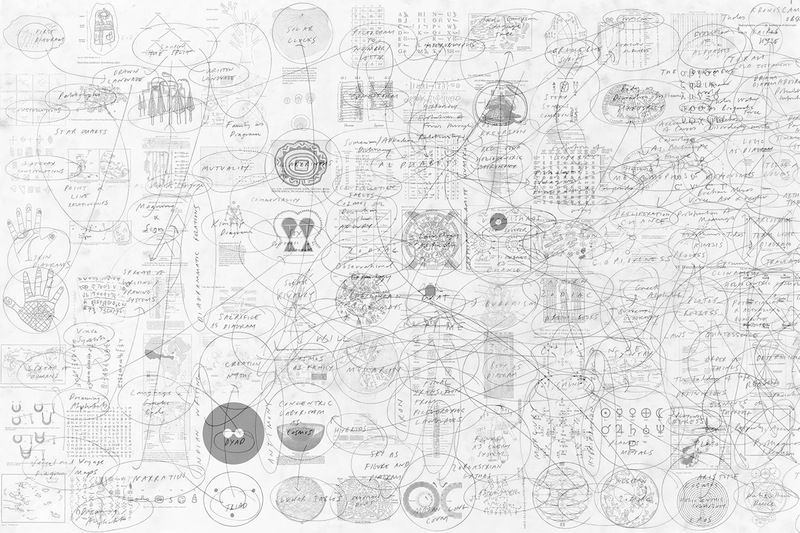 Since the early 1990s, Matthew Ritchie has been developing an accumulative, complex narrative drawing from the vocabularies of science, sociology, anthropology, mythology and the history of art. 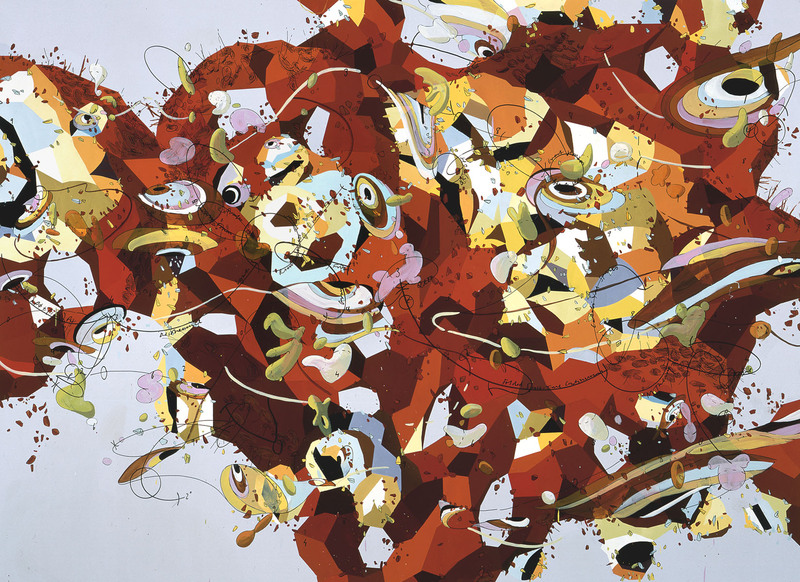 Perhaps best known as a painter, Ritchie has also collaborated with physicists, musicians, and architects to create architectural environments, games of chance, and an epic orchestral work. In autumn of 2015, Ritchie spoke with VoCA’s Robin Clark about how philosophies of time influence his work, the lure of the unfinished, and the compulsion to complete. Following is an edited transcript of those conversations. Robin Clark: You’ve expressed an interest lately in considering “the ways that time changes work.” What do you mean by that? Matthew Ritchie: This probably has to do with getting older, having a depth of perspective not only on your own practice but how other practices around you of your own generation and earlier generations have evolved and to see what lasts and what doesn’t. And that’s been especially exaggerated in the contemporary condition–everyone’s talked about this–the speeding up of both information reception and transmission. I think it’s a significant milestone that more machines are now connected and communicating with each other than human beings are. So the question that comes up right away, something that I’ve been writing about, is the direct equivalence of information and material. In 1871 James Maxwell proposed a thought experiment in the form of a mathematical ‘demon’ that could violate thermodynamic laws by ‘knowing’ how to change the physical state of a system without paying a proportionate energy cost–a super-ordinatory force outside the material structure of the universe. For more than a century, this idea offered one last loophole for categorical thinkers inclined to a non-thermodynamic view of information theory. In a world without God, we hoped there might still be demons. But in 2010, the scientist Shoichi Toyabe demonstrated that every information transfer has an exactly equal price in expended energy.1 So information (or thought), energy and matter are interchangeable and subject to the first and second laws of thermodynamics–which state that nothing, whether it is information, energy, or matter, is ever truly lost, but everything must and will change. This is very significant for a society that has shifted to an information economy. We now have more data generated in a single year than in all of human history before. One tenth of the planetary energy output is consumed to support the internet. I think this has changed our way of thinking about things that are stable, like painting, and also things that are performative, conducted within time, but we haven’t come to terms with any of that. We’re just at the beginning of that process. The shift is so vast, to have an external memory, to have an understanding on an ever-more sophisticated basis that the very atomic constituents of things that we think of as stable are shifting at different rates. It’s similar to geology, where there are lots of different rates of change, there’s a solid core then magma, then there are layers of less stable rocks, and then more stable mantle floating on top of all that, and then you move up to the atmosphere and they’re all shifting in relation to each other all the time. Our difficulty is accepting these changes in our world view sometimes leads to an odd but very anthropomorphic insistence that the world is broken in some essential way – just because we cannot articulate a coherent world view at this time. Scientists may sometimes describe the universe as ‘decoherent’ but this is only to distinguish it from its original state of total quantum coherence–it does not mean the universe is ever ‘incoherent’ although it may appear so to us. Clark: I’m curious whether you can discuss the ways that these ideas might inform specific works of yours, such as M Theory (2000), a painting that is now entering SFMOMA’s collection? Ritchie: M Theory was the first in a body of work called the Main Sequence (started in 1997 and concluded in 2003) which aimed to describe the development of the universe through a fragmented narrative that incorporated elements from multiple and contradictory sources. The paintings served as both focal points and summaries of this project. Each one attempted to take on an entire field of knowledge, like biology or classical physics, and use a metaphoric vocabulary to characterize the field into a “story,” using a final layer of indicative diagrams to create a simplified model of agency. Clark: Can you explain how that worked in the example of M Theory? Ritchie: The formal structure of M Theory is similar to most of my paintings from that period. A hard ground, in this case a pale amethyst field, is overlaid with complex geometric pseudo-solids, each containing multiple color zones. Here, the crystalline red structure refers to “the landscape,” a concept in string theory that allows for the separation of very distinct physics regimes. The rapidly painted marks on top of this tessellated surface indicate the smaller, rapidly inflated “bubble universes” proposed by theoretical physicist Andrei Linde. The red fingerprints refer to the thermal signature of the big bang, sometimes called “the fingerprint of the universe.” The scribbled texts on the surface are string theory equations describing the relational terms through which our universe (and possibly many other variants) can exist. Many of these terms, such as surface, action, harmony, curvature, line, sheet, and even the idea of a vibrating, energetic, string itself seem to have a direct resonance with the history of painting. Clark: What is particularly compelling to you about “M Theory” as a concept? Ritchie: The painting was made five years after Edward Witten proposed the real “M Theory,” a possible theoretical framework for a unified “theory of everything.” For a new and struggling immigrant in the United States, the liberating flow of newly available information in the emergent internet culture seemed to give the project a sense of meaning and timeliness. Artists like Matthew Barney and Kara Walker were appropriating and repurposing mythologies, sciences, and sociologies left and right, combining the take-no-prisoners confidence of neo-expressionism with the aesthetics of the pictures generation and reviving long-defunct installation and performance strategies of post-minimalism. It was an unusually open and spectacularly human moment, the end of a millennium. Clark: What led to the end of the Main Sequence? Ritchie: The meaning of the Main Sequence project was transformed over time by joy and tragedy, both personal and international. My work evolved into film, theater, and music and architecture projects, often based on related speculative sources such as the Mayan time-myth, Steinhardt & Turok’s time-cosmology and Randall’s dimensional space-time physics. But M Theory was, and remains, a very important painting for me. Not only because the conditions have never been quite right for the precise mixture of optimism, ambition, and absurdity that prevailed in the year 2000 AD, but because it symbolizes the difficulty, absurdity, and necessity of attempting the impossible. Clark: Jumping to the present day, how are some of these themes expressed in your current work? Ritchie: The Main Sequence works and my current paintings both convey the sense that something is emerging, but continually emerging. It never quite arrives. Rather than the classical model of music with a climax, which is sort of how traditional painting has continued to represent itself, I’ve always felt that my paintings are unfinished because they are trying to represent a totality that is impossible to represent. There are a lot of younger artists, whose work I love, whose work is sort of ostentatiously unfinished, as if to say, “hey look, I didn’t finish it.” To me that’s a very dramatic and artful way of finishing something, to just stop–like Gogol ending Dead Souls in mid-sentence. But I suppose I’m more interested in acknowledging that the only way to truly make something unfinished is to try to finish it, to acknowledge the incompleteness of any single worldview by attempting a proof. That’s when it will truly fail! Clark: There’s going to be a show at the Metropolitan Museum of Art in spring of 2016 about unfinished painting, both things that are really unfinished and things that were perceived as unfinished because they didn’t meet expectations of a certain moment. Ritchie: When considering the potential longevity of an artwork, the notion of efficiency is more interesting to me than whether something is complete, or incomplete–or even “good” or “bad”–which are meaningless contemporary terms. If we can say that something is radically efficient at getting us to look at it, then it will still be in the Metropolitan Museum two thousand years from now because nobody threw it away. It was efficient at sustaining human attention over thousands of years. If it is not efficient, it hits the garbage heap in one way or another. If it’s too fragile, it’s too big, it got lost, somebody broke the nose off it… given how many audiences a work of art has to survive over thousands of years it is remarkable that anything survives at all, because we are so fickle. There are a lot of “unfinished” works that are just a bunch of stuff and will just dissolve back into being a bunch of stuff because the absence of it being finished was not an inherent property. That’s not to say the organization and performance of many collected objects can’t cohere into something larger than its parts–only that it is very thermodynamically difficult. An artist like Jason Rhoades is someone I think of where each project was done to its conclusion. It’s confusing and its complex but its not incomplete. I’m always drawn to this: in a discipline like architecture or performance or science or philosophy, if you take it out of the art world you are sort of forced to complete some elements just to allow other people to access the process. There’s no tolerance for “well, like, I’m an artist, isn’t it cool that I stopped working?” In most other disciplines the answer will be, “no, it’s not cool, not cool at all, you have to finish your work.” At the same time I think there are artists of incompleteness who programmatically refuse to complete their projects, like Gedi Sibony. If you are taking incompleteness as your first premise, and it is inherent to the work–like wabi-sabi, that’s obviously a form of completeness. I’m drawn, obviously, to the opposite extreme, an absurd need to enforce completeness that will actually generate an unexpected proliferation of incompleteness. Clark: How are you exercising your “completionist” inclinations at the moment? Ritchie: For several years I’ve been working on a comprehensive visual history of the diagram. I developed the project during a fellowship at the Getty Research Institute, have done a couple of installations and am working now on an edition with the Getty. Although organized loosely as a timeline of the use of diagrams across history, the project is primarily concerned with relating the diagram as a tool of inquiry to both its expressive and causal forms. If we can accept that ‘form’ and ‘content’ are the same thing, namely information and do not enjoy any inherent oppositions at any scale then diagrams are one way that the profound questions of relative time, scale, distance, gauge symmetry, proximity, and imagined immunity from discontinuity and relationality that define our use of any shared informational space become evident. The Getty project is both a history of the diagram, an art historical thought experiment and an anti-history–as the idea of the diagram itself constantly fights against the idea of linear development, preferring to proliferate in every direction, including across time. But to fully honor the central premise of my own diagrammatic enquiry and the doubled nature of diagrams as both vector and table, of course the project must immediately shed the comfort of its own completionist instincts and open itself back up to new and incomplete forms of diagrams–so there is no end in sight. “Experimental demonstration of information-to-energy conversion and validation of the generalized Jarzynski equality,” Nature Physics 6 (2010): 988–992. Robin Clark is Director of the Artist Initiative at the San Francisco Museum of Modern Art, a Mellon-funded research grant that takes an interdisciplinary, team-based approach to collections research and care in collaboration with participating artists. She curates, writes, and teaches on a range of topics including the architectural imaginary in contemporary art, light as a medium, and museums proposed by artists. Matthew Ritchie is a visual artist based in New York. 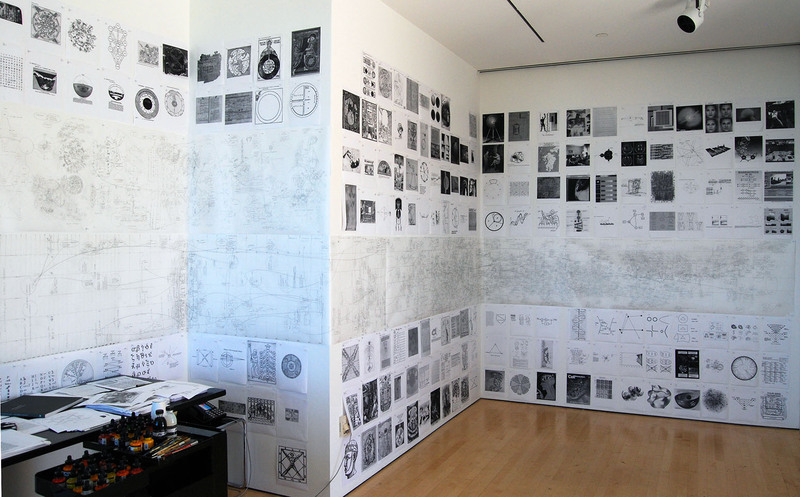 His installations of painting, wall drawings, light boxes, sculpture and projections are investigations of how information assumes form over time and have been shown in numerous exhibitions including the Whitney Biennial, the Sydney Biennial, the Sao Paulo Bienal, BAM Next Wave, The Holland Festival, the Venice Architecture Biennale, the Seville Biennale and the Havana Biennale. 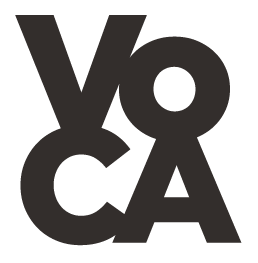 Cite this article as: Robin Clark with Matthew Ritchie, "No End in Sight," in VoCA Journal, November 11, 2015, http://journal.voca.network/no-end-in-sight/.